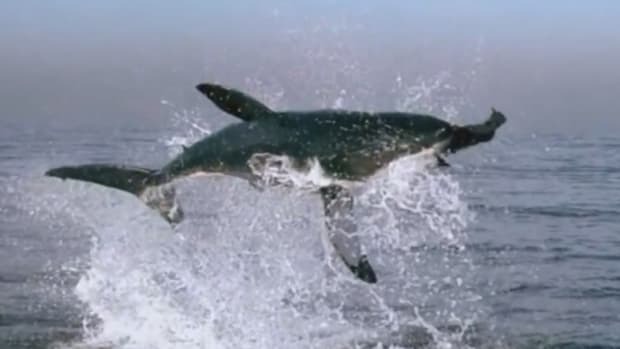 No, it's not a satirical article from The Onion or a clever Facebook meme. A publishing company called Really Big Coloring Book is actually manufacturing a Ted Cruz coloring book titled -- I'm not making this up -- "U.S. 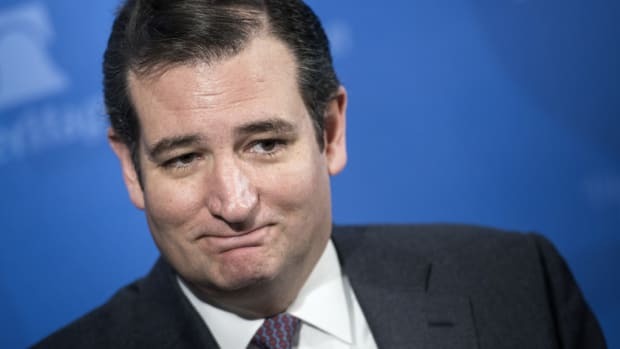 Senator 'Ted' Cruz To The Future: Rafael Edward 'Ted' Cruz." If you have children, be prepared to fight your way through the toy store for this year&apos;s hot Christmas item. No, it&apos;s not the Xbox One or a Furby. 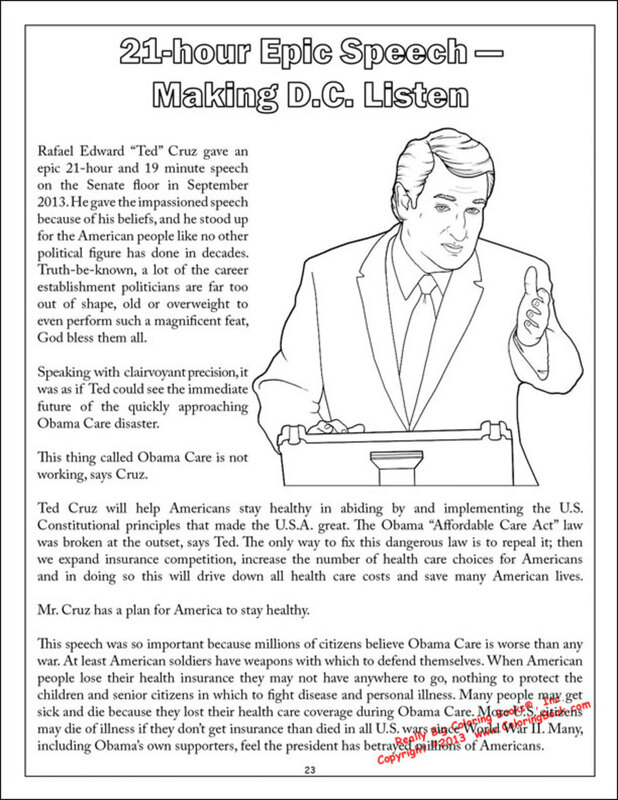 Your kids will be forever grateful if you forgo those items and, instead, get them their very own Ted Cruz coloring book. Because nothing says hours of coloring fun like coloring... Ted Cruz. No, it&apos;s not a satirical article from The Onion or a clever Facebook meme. 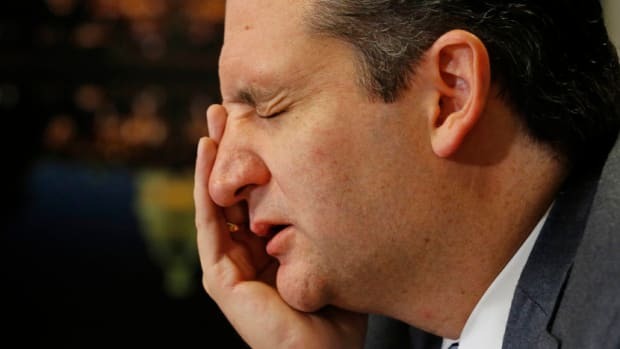 A publishing company called Really Big Coloring Book is actually manufacturing a Ted Cruz coloring book titled -- I&apos;m not making this up -- "U.S. 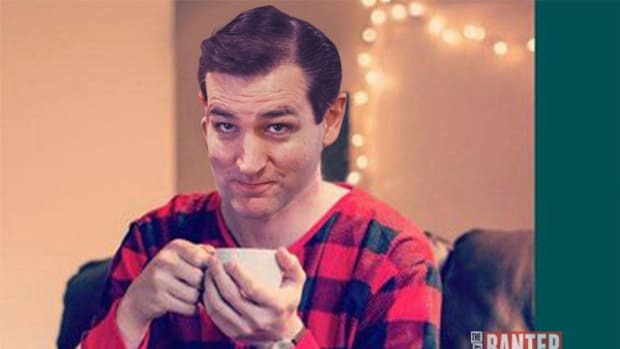 Senator &apos;Ted&apos; Cruz To The Future: Rafael Edward &apos;Ted&apos; Cruz." 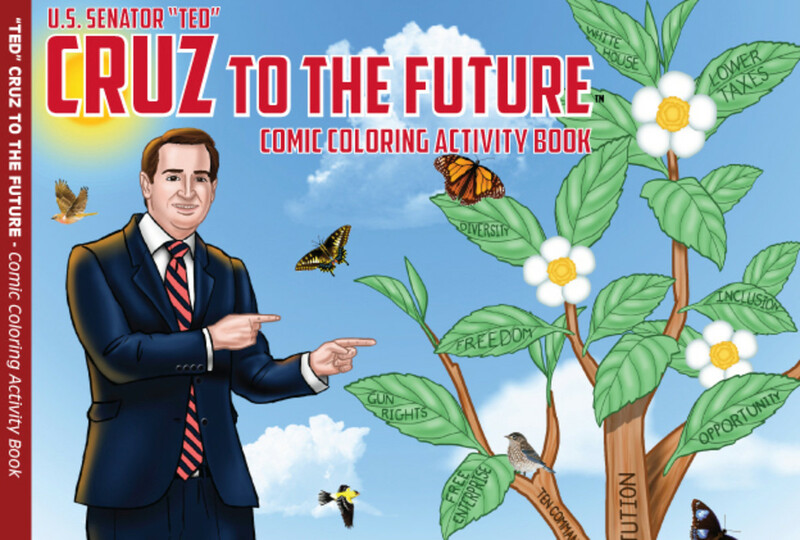 The cover features a cartoon version of Cruz standing in a field and pointing, Isaac-from-The-Love-Boat style, to what&apos;s clearly the world&apos;s largest "Tea Plant." The trunk of the plant is labeled "U.S. Constitution" and one of the branches is labeled "Ten Commandments." The Ten Commandments branch features two, not ten, leaves labeled, oddly, "Free Enterprise" and "Gun Rights." It&apos;s been a while since I&apos;ve been to church, but I wasn&apos;t aware that free enterprise and gun rights were commandments, but okay. Also, I&apos;m not exactly sure if this means anything for 2016, but one of the leaves is labeled "White House" and it&apos;s at the very top of the tree. Oh, and the grass is labeled "Grass" and, just below it, the tea plant&apos;s roots are labeled "Roots." Get it? Grass roots. Clever! Maybe I&apos;m reading too deeply into the meaning of the cover, but it could symbolize the tea party growing from the grass-roots to the White House. Inside, the book&apos;s publisher, Wayne Bell, describes the coloring book as having been designed for "kids of all ages," and it isn&apos;t "an official endorsement of Ted Cruz." However, in the very next sentence the publisher describes Ted Cruz as a "real life superhero." Wow. A superhero. More about this presently. 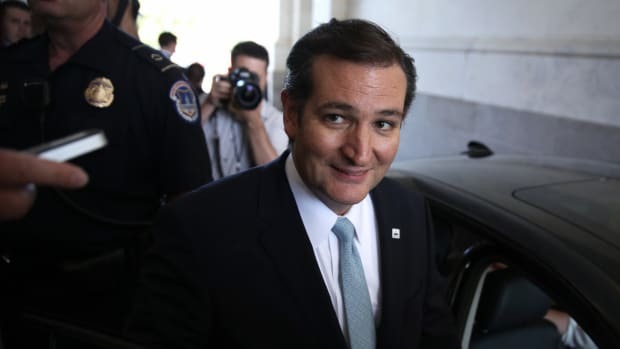 "Cruz has stated the president (Obama) has a disregard for the Bill of Rights." I suppose that&apos;s an accurate statement about the senator&apos;s (Cruz) position on control (gun). 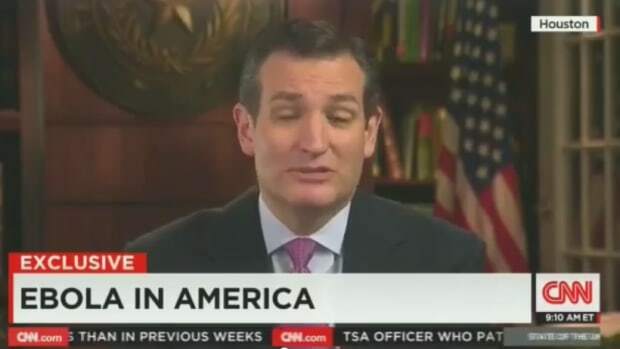 But as far as the president&apos;s (Obama) position on the Bill of Rights, Cruz (Ted) is, of course, wrong (an idiot). It continues, "That is not surprising, and it is unfortunate Obama and his administration have a consistent disregard." Consistent disregard for the Second Amendment? Um, when? The last I heard, the president has only ever pushed for closing the gun show loophole in the context of a weak bill called the "Second Amendment Rights Protection Act." Not much else. Then again I suppose it&apos;s important to indoctrinate kids with the meme that the president (Obama) is obsessed with seizing their guns. And then this: "It seems he uses any opportunity to go after the Second Amendment right [sic] and other constitutional rights such as free speech." Wait -- free speech? What? When? This is a coloring book? Then we land on page 23, titled "21-hour Epic Speech -- Making D.C. Listen," and things get really hagiographical. Cruz&apos;s filibuster was evidently an "impassioned speech... like no other political figure in decades." 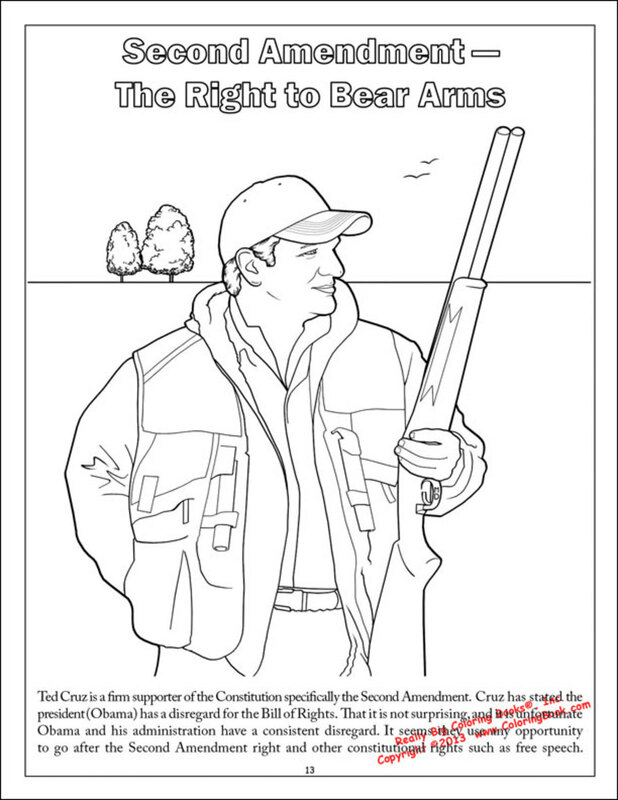 This coloring book should&apos;ve checked with Rand Paul&apos;s coloring book. "Truth-be-known, a lot of the career establishment politicians are far too out of shape, old or overweight to even perform such a magnificent feat, God bless them all." In other words, doughy Ted Cruz is a superhero because of his filibuster. But wait -- standing and talking isn&apos;t Cruz&apos;s only super power. He&apos;s also clairvoyant! "Speaking with clairvoyant precision, it was as if Ted could see the immediate future of the quickly approaching Obama Care disaster." Okay, so that&apos;s the funniest sentence in the book. Clairvoyant precision? Remember what the publisher wrote on page one? "Not an official endorsement." I can&apos;t imagine what an official endorsement would look like. The only way he could top "clairvoyant precision" would be for the publisher to become Superhero Cruz&apos;s youthful ward and crime-fighting sidekick. But I get it. "Obama Care" is a disaster, according to the, you know, coloring book. So, what&apos;s Cruz&apos;s solution for healthcare? 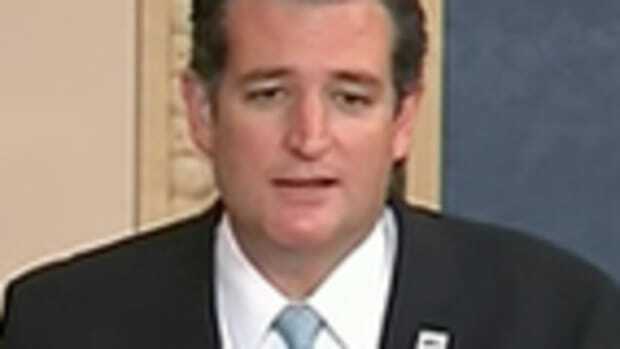 "Ted Cruz will help Americans stay healthy in abiding by and implementing the U.S. Constitutional principles that made the U.S.A. great." That makes zero sense. Sarah Palin-y word salad. And did you know that "Obama Care" is "worse than any war?" The coloring book says, "At least American soldiers have weapons with which to defend themselves." And that&apos;s not all, "More U.S. citizens may die of illness if they don&apos;t get insurance than died in all U.S. wars since World War II." What? Really? As opposed to what, exactly? 3,000 Americans died every month due to a lack of health insurance before the implementation of the ACA. Now many of those people, regardless of circumstances or pre-existing conditions, will be able to sign up for new, and in some cases, less expensive policies. I&apos;m debating a coloring book. Maybe that&apos;s my cue to stop reading it. The last page asks, "What do you have to say to Mr. 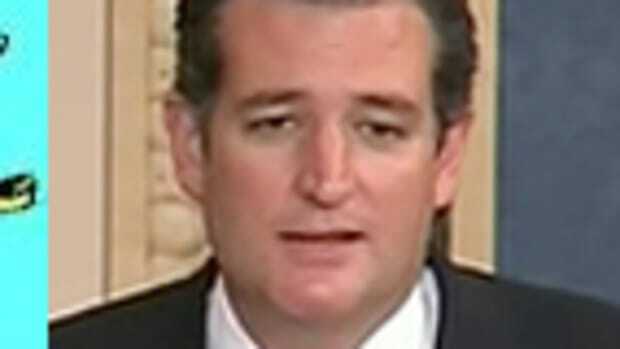 Cruz?" Well, there&apos;s a long list, but if I had to narrow it down it&apos;d probably be, "Resign."